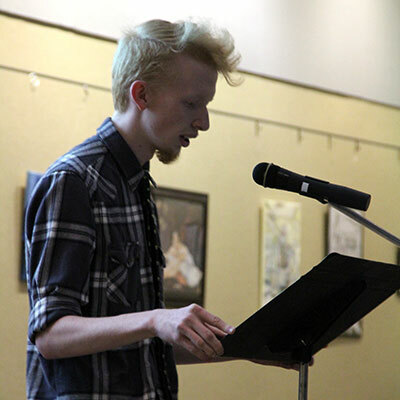 The Creative Writing Program at Cowley College recently hosted their final Writers’ Corner for the academic year, which was followed by a reception honoring the writers who will graduate this month. 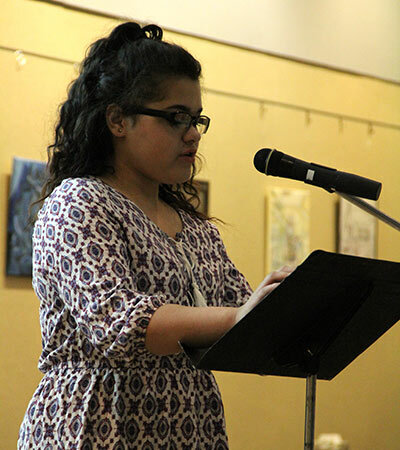 Thirteen writers presented 32 poems or short fiction/non-fiction to an appreciative audience of other students, faculty, family, and friends. Graduating honorees were Daltin Brock, Kaitlyn Cathey, Austin Crowe, Allie Lawrence, and Katie Rethmeier. Other special guests were high school graduates who have been active with the program while in high school, Isaac Cervantes and Quinn Johnson, as well as vice president of academic affairs, Dr. Harold Arnett. The next major event for the program is the student showcase, LIFE: Through Words and Lens, Wednesday, May 10 from 6:30-8 p.m. There will be portfolios presented by writing students and photography hanging by students in the photography class. In addition, several pieces of photography, cards, and an edition of Mile Marker Review will be on sale at the event. It will be held in the Earle N. Wright Community Room, and refreshments will be served. Contact Marlys Cervantes at 620-441-5560 or marlys.cervantes@cowley.edu if you are interested in the program. Creative Writing scholarships are available for fall 2017 Cowley freshmen.